One of the strongest reasons that "incandescence" merged with "inkan" to become my trademark is the power of luminous moments like encountering an ancient river in the middle of a busy city at sunrise or walking in the hills among fall foliage. 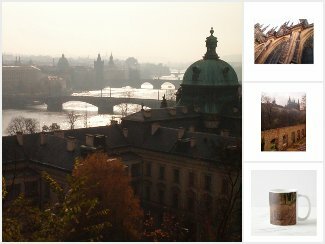 Scenes from Prague, taken on a memorable morning walk in 2002, were among the first I turned into designs for signature Inkandescence products. Inkandescence in Prague features art specifically from Prague, keeping alive the original theme of this shop. Before and After is a line of mugs and steins that cuts across all my photographic, poetic, and travel themes. The Aquinas Resistance and The Dogma Lives Loudly are lines of products that will put heart into those who want the Catholic faith to shape their lives, even in difficult times. Photography from Peter G. Epps and Art by Peter G. Epps are lines of products based on pictures from my travels or other works of art, completed or in progress. My brother discovered and adopted Ting mobile phone and data service some years ago, and I waited until I was ready to switch around all my services to sign up for them. I'd have saved myself a lot of disposable phone cards if I'd switched sooner. The fee structure is transparent and equitable, and the coverage is good (obviously, you may want to do some research, but we've had no problems). I keep the bills low, so if you are in the market and sign up using my referral link, you'll probably just have paid my phone bill for the month!